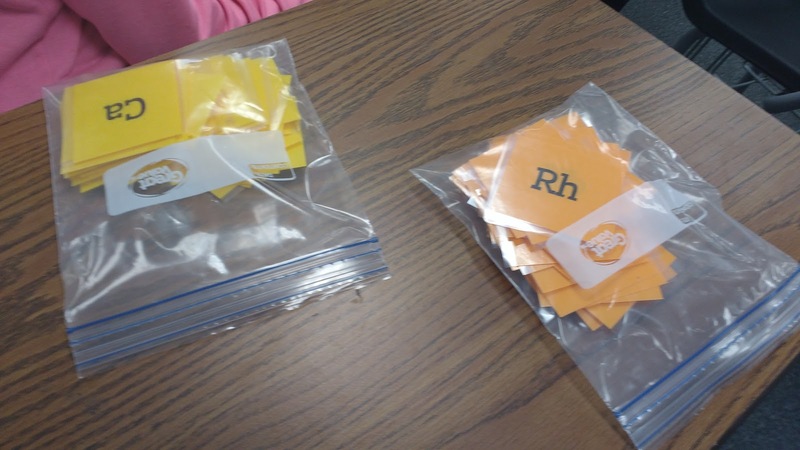 I created this game to give my students more practice becoming familiar with the periodic table. It's based off of the card game, War, which is a common choice of card game to adapt for various math concepts. You can play logarithm war, trig war, integer war, radian and degree war, fraction war, linear war, or evaluating functions war (a game I apparently haven't blogged about). Students always love the competitive nature of the activity, and I always love how much practice a game of war can fit into a class period. So, it was the perfect choice for making an activity for my Physical Science students. I started by making a template to create decks of periodic table cards. 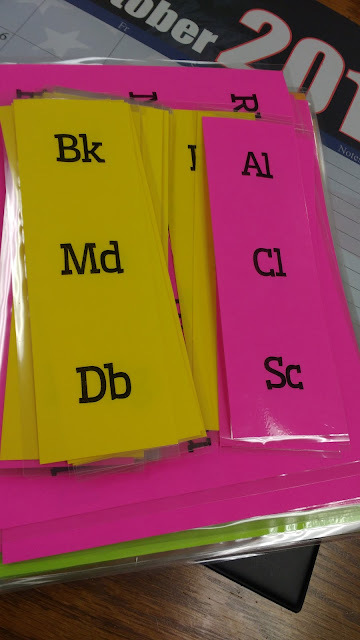 I chose to only put the chemical symbol on the cards because I want my students to reference their own copies of their periodic tables in their notebooks. After typing 9 pages of cards, I stopped at Hassium. If you desperately want the few elements after that, you could easily add another page to the file. Then, I printed the cards on different colors of Astrobrights paper and laminated them. Then, the paper chopper and I became VERY good friends. Each color of cards got their own ziploc bag. 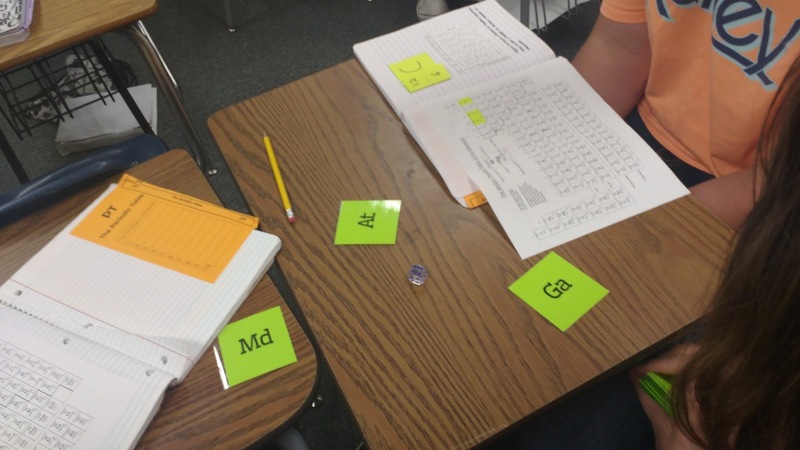 To play this game, you need to decide exactly what periodic table skill you are practicing. This game is easily adaptable to many different levels of physical science/chemistry. My students are currently practicing calculating the number of protons, electrons, and neutrons in an atom. We're also still a bit rocky on reading the periodic table. So, these were the types of skills I was trying to practice. I decided I wanted to practice a mix of these, so I introduced a 6-sided die into the game. You could also play with a die with a different number of sides if you wanted to practice more or less skills at the same time. I recommend investing in a set of polyhedra dice for you classroom because they make it so easy to make up games on the fly! If you wanted to practice a single concept, the die would not be necessary. 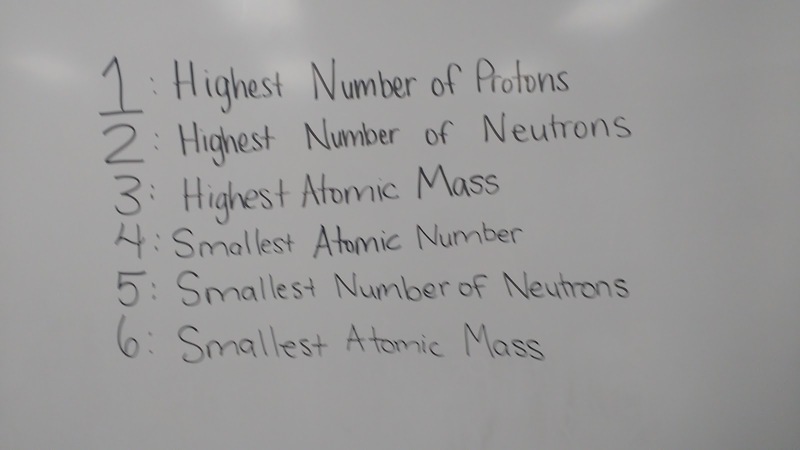 For example, you might want students to practice comparing the atomic radius. The student who turns over the element with the larger atomic radius would win. Later this chapter, we will get these cards out again to practice determining the number of valence electrons an atom has. For this version of the game, we will not need a die. Here's how we did end up playing in order to practice comparing mass, atomic number, and number of protons, electrons, and neutrons. 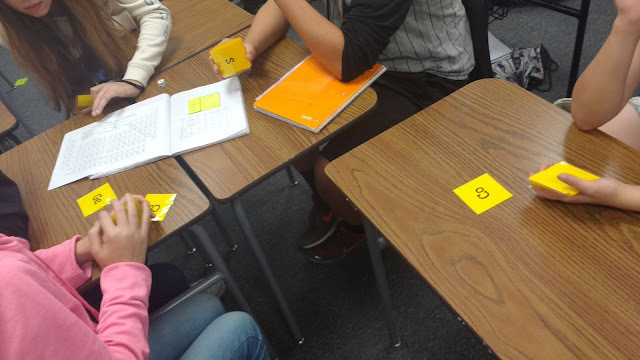 Students take the deck of cards and deal them out evenly. Ideally, students will play in groups of 2 or 3. Larger groups are possible, but it can take a while for students to figure out who won. 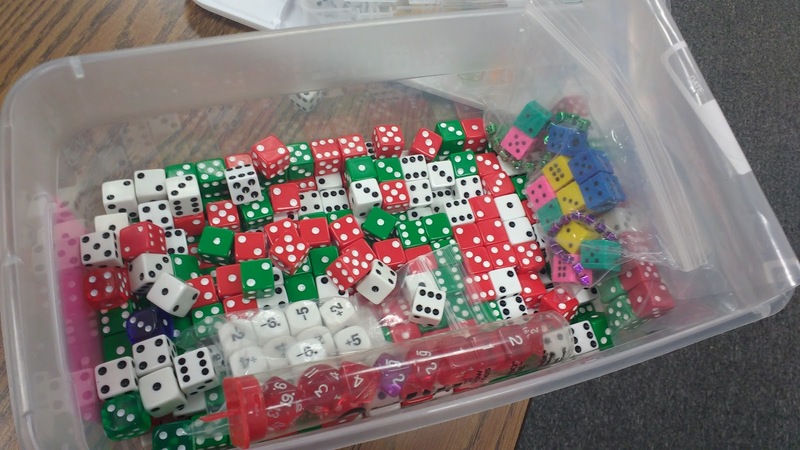 Once the cards are dealt, one student rolls the die. This die will determine what rule will be used to determine the winner of the first round. 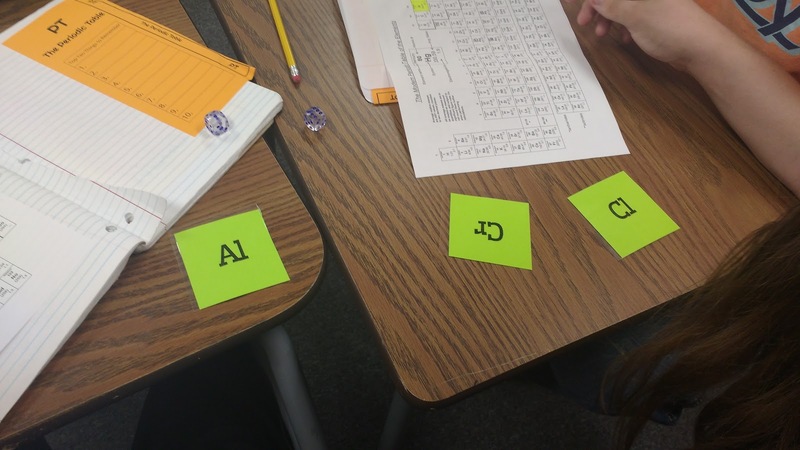 If the first roll was a 5, then whichever student turned over the element that typically has the smallest number of neutrons would win all of the other player's cards. After determining the winner and handing over the cards, the die is rolled again. Typically, a game of war is continued until one player has ALL of the cards. This game has SO many cards that it really isn't feasible to play that long. (Of course, you can make the game have as many cards as you want. The element cards are in order, so you can just print as many pages as you want.) For this game, I set a time limit and stated that the student with the most cards in their pile when the timer went off would win. Here, you can see students referencing their interactive notebooks. 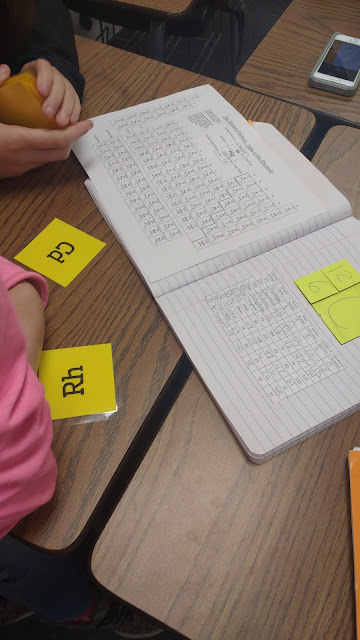 I've decided that I need to print some periodic tables on 11 x 17 cardstock to pull out for activities like this in the future. This game led to some awesome conversations with my students. I'm looking forward to pulling these cards out again when we start identifying how many valence electrons an atom has. I believe having these decks of periodic table elements will come in handy throughout our chemistry units! You can download the cards for this activity here. The font is Wellfleet. awesome idea! And very clearly explained! Thanks! I will be using this in my classroom this week. I introduced the concept last week and even with a few practice problems it's not clicking for a lot of them. I think the game would give them the practice in a much more fun way than just more problems. This looks like a fun idea, although the teacher next door to me may complain about the inevitable noise. Had no clue there was such a thing as element slogans. Very cool!